on behalf of the organizing committe and myself, I invite you to participate to the 64th Congress of the Italian Physiological Society (SIF), that will be held in Portonovo on 18-20 September 2013. Organizing the Annual Meeting of a Scientific Society has always be very gratifying for local organizers. 2013 is a special year for Physiology, as we celebrate the bicentenary of the birth of one of the founding fathers of our discipline: Claude Bernard (1813-1878), whose lesson has certainly much contributed to the extraordinary growth of Physiology and, either directly or indirectly, both to our view of the world and to the way we perform our wonderful work. 2013 is a special year for Ancona too, as it celebrates 2400 years of its foundation by greeks of siracusan origin in 387 b.C. That the organization of the 2013 SIF meeting has been attributed to Ancona in the year in which we celebrate Cl. Bernard and the foundation of our town certainly increases our satisfaction. By working together with the Steering Committe of the Society, we aim at offering a Meeting that rises to the occasion. Portonovo, a small bay 8 km south of Ancona on the Adriatic sea, is a beautiful seaside resort in the heart of the Conero natural park, untouched from mass tourism, that should provide optimal conditions for nice days of science. All events will be held at the Portonovo Congress Center, consisting of two hotels (Fortino Napoleonico and Excelsior La Fonte). The program of the meeting will be similar to that of previous years, although, in agreement with the Steering Committee, we shall introduce some changes that we hope will widen the scope and/or facilitate the logistics. Among the former, a Workshop on Comparative and Environmental Physiology, jointly organized by SIF and the newEuropean Society of Comparative Physiology and Biochemistry , and the presence of guests from the 1st Regional Congress of the Physiological Societies (Rijeka, Croatia, September 13-15 2013). As a sign of respect and hospitality for our foreign colleagues, the program will be in english. Among the latter, we shall introduce an interactive program that will allow to access both online and offline to abstracts and needed info in a clic. The Social dinner (included in the registration) will be served on the roof terrace of Fortino Napoleonico Hotel, with a scenic view on the bay. 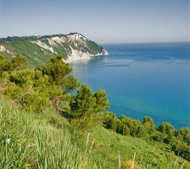 Accompanying persons will have the opportunity to choose in a wide array of celebrated places in the Marche region. I welcome you most warmly, and I look forward to seeing you in Portonovo.